Features CUSTOM WOUND INDUCTORS (Inductors are the heart of every wah pedal and are also critical to the funky sound of the clavinet!). FUN FACT: Wah pedal enthusiasts pay top dollar for vintage clavinet-style inductors! Hand assembled with low-noise, audiophile-grade components (Wima capacitors, 1% metalized resistors, Low Noise NPN transistors). Quieter than original preamp as it incorporates a "ground plane" which shields the PCB internally. No need for a shield box! Includes a power regulator and filter circuit, which allows use of external AC power supplies without adding noise. The "Stevie Wonder" mod (old preamp upgrade kit) is built into the new preamp! No case modifications necessary - retain the vintage, classic look of your clavinet! Drop-in replacement board uses same mounting holes as original PCB. Each unit comes PRE-ASSEMBLED, requiring a minimal amount of soldering to install. All kits come with full detailed installation instructions. 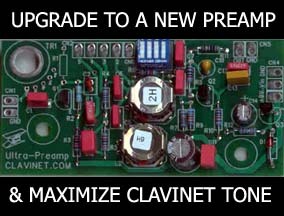 Note #1: The Clavinet.Com Ultra-Preamp does NOT include the Barrel Transformer, which can be re-used from your existing Clavinet D6 PCB.Clavinet II or C owners MUST purchase a Barrel Transformer! 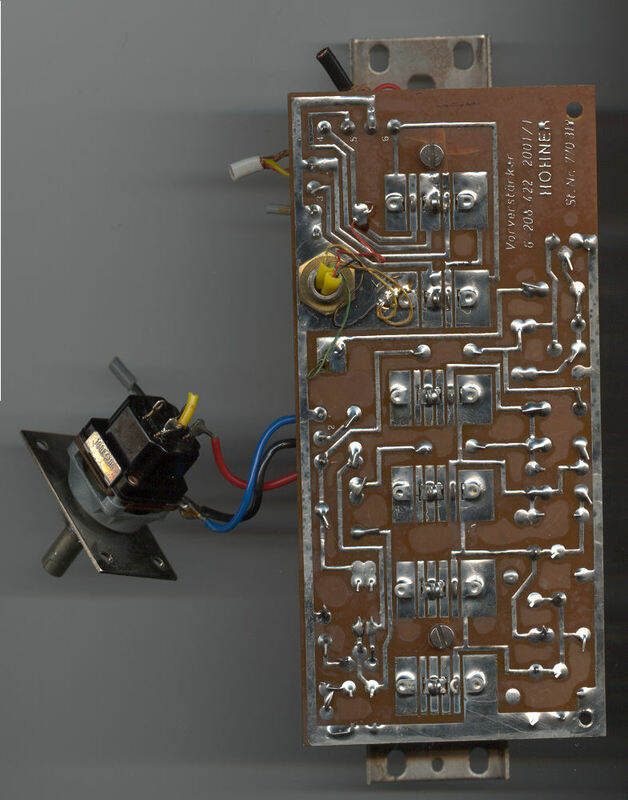 Note #2: NOT FOR USE WITH CLAVINET D6 PREAMP/SWITCH ASSEMBLIES (SUCH AS THE UNIT PICTURE HERE) or Clavinet E7/Duo.